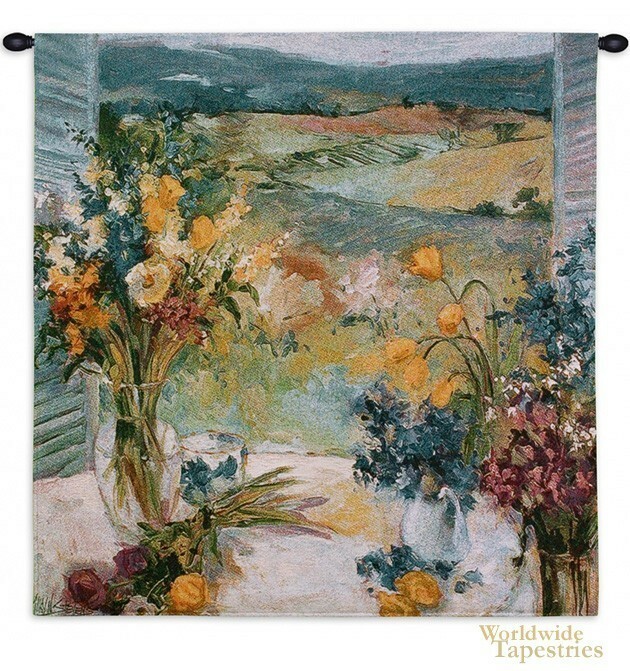 Tuscany Floral tapestry shows a beautiful countryside scene with a table of flowers in the foreground. The gorgeous landscape of the Tuscan region is seen as rolling green hills. The mountains beyond are rendered in violets. In the foreground a table of flowers in bloom in yellows, blues, reds and oranges. This work truly celebrates the color and beauty of this region of the Mediterranean. Tuscany Floral tapestry is backed with lining and tunnel for easy hanging. Note: tapestry rod, where pictured, are not included in the price.